One of the biggest questions with an upgrade is to see if it can be completed over a cutover weekend. Are there enough resources available to complete the task within the needed time frame? Is there a way to tell beforehand or will additional resources need to be brought in? For many clients answering these questions can be a challenge. Many do not have installations that match from one system to another (i.e. QAS doesn't have the same setup as PRD). Estimating the time needed to upgrade a production system needs to be based on the time it took to upgrade DEV and specifically QAS. Other clients have shared resources in one environment but not another. In these cases, what you can do complete the upgrades in the non-production systems and create an estimate. Then, as you are stepping through the pre-processing phases of the production upgrade, revise those estimates. Here is a quick example of what can be done. The screenshot shows the time it took to complete an upgrade in both the DEV and the QAS systems. 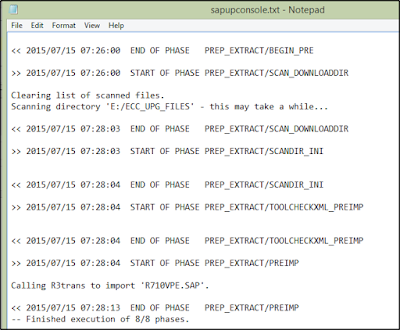 What I've done here, is to pull the time from the report generated at the end of each of the upgrades. As you can see, the EQ1 system is a bit faster than the ED1 system. I'm not including the hardware here (at least not yet) because I want to make a quick point. Estimates for time it will take for the production upgrade based on the previous upgrades are just going to be general ball-park estimates. Those estimates are not going to be realistic until they are revised based on the time it takes for the few steps of the production upgrade. Here is an update to the example above. Above, I've created a base estimate on the amount of time it should take for each step in the production upgrade. I know that production has more memory (24 GB versus 12 GB) and more CPU (8 cores versus the 4 in Q). So I've put in a rough 20% improvement in time for each phase. I also updated the other two columns as a sanity check against my original estimate. Once I start feeding data in from the active upgrade, I'll know which estimates are closer (part of me always hopes that I'm closer to the right than the left!). Now comes the fun part. We've started the upgrade and completed the first three phases (normally in an upgrade you can complete these steps in a day or two). 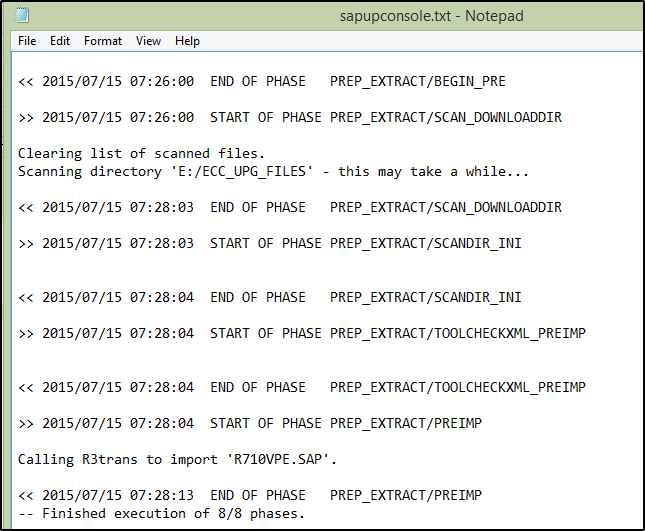 I pull the time required from the first phases from the sapupconsole log file. It's messy, but I can calculate the time for each phase by extracting the time for each step in a phase and then adding them all up (and who said Basis wasn't any fun?). Based on what I calculate for the first three phases, I update the spreadsheet as shown below (adding a calculation to show the percentage difference between the 'real' time and the time it took to complete the same phase in EQ1). Then I check to see how far off I am from my original estimate (of 20%). As you can see, I'm off on the 20% estimate but pretty close to the 30% column (the number at the bottom of the column is an average). What we now have is a more accurate view of the time it will take for each phase in the upgrade. The overall upgrade plan can be updated to reflect these times.